This picture by Jon Smalldon from Little Common's home game against Langney Wanderers in February shows in the background the temporary enclosure Common put up on matchdays. Little Common Football Club will play its home games nearly 10 miles away in Eastbourne next season to avoid the possibility of being relegated. The Macron Store Southern Combination Football League Division One high-flyers have signed an agreement with Premier Division side Eastbourne United AFC to groundshare at The Oval in order to meet ground grading requirements. Following a ground grading inspection back in February, the club was informed that its Little Common Rec home would not be awarded a ‘G’ grading (the grading required to play in SCFL Division One) due to the temporary enclosure system it uses on matchdays. To be awarded a ‘G’ grade, a ground has to be permanently enclosed during the course of the football season, which is something landowner Rother District Council is unwilling to allow due to the Recreation Ground being public open space. The Commoners - who are set to finish in the third promotion place - were informed in March they were a ‘relegated’ club and could face relegation at the end of the season as they are one of only two clubs who do meet the ground grading requirements in the division. “It was suggested that we look for a groundshare to prevent relegation so we approached Bexhill United regarding a groundshare at The Polegrove,” continued Eldridge. “Both the SCFL and Rother District Council (also the landowner at The Polegrove) supported this idea and an initial meeting was held with Bill Harrison (Bexhill United chairman) and RDC to discuss initial thoughts, which Bill said he would report back to his committee. “However, following a meeting of their committee, we received a letter from Bill informing us that our proposal had been rejected and Bexhill United FC did not wish to enter into a groundshare arrangement with us. 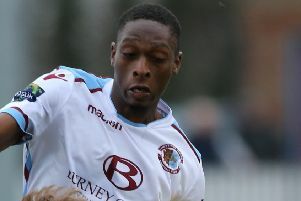 Eastbourne United came to Common’s aid just two days before the March 31 deadline and an agreement was quickly reached. “We can’t thank the Eastbourne United committee enough for their support and the manner in which they were quickly able to produce a contract that could be signed and sent off to the SCFL and the FA,” Eldridge went on. “Playing our home matches 12 miles away in another town is not an ideal scenario and not one that we ever anticipated being in, but we want to remain a senior club so it is something that we are prepared to do. “It has been a difficult month or so with all this going on behind the scenes, especially with the players working so hard on the pitch, but at all times we had to think about the future of the club and its senior status - we worked incredibly hard to get back into this league and certainly do not want to go back to playing intermediate football. “It is all very frustrating and I have tried everything possible, every loophole has been investigated but to no avail - as a club we could have done no more. On the plus side, the groundshare arrangement means Common now have an ‘F’ grading, which will allow them to enter the FA Cup next season for the first time in the club’s history and their lofty league position should allow them to be accepted. Easter Monday’s match against Bexhill United will therefore be Common’s last first team fixture to be held at the Rec for the foreseeable future. Langney Wanderers have had a similar groundshare arrangement with Eastbourne United this season, but it’s understood they are in advanced talks to share with National League South club Eastbourne Borough next term.